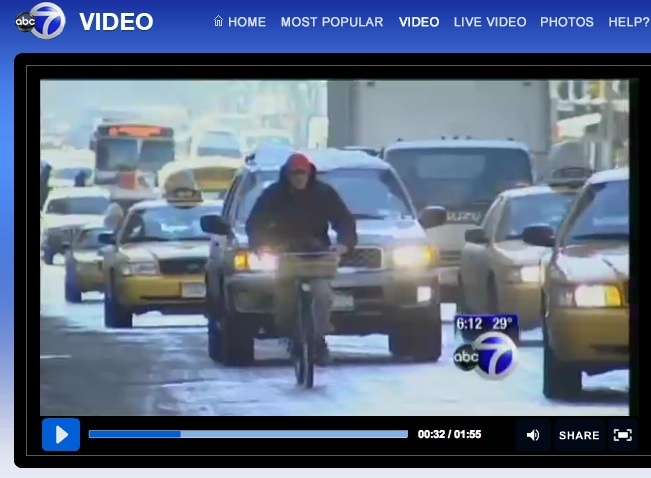 Take a look at this screen shot from a WABC-TV report on proposed bicycle registration and licensing in New York. It’s as good a Rorshach test for how you see the current state of affairs on our city’s streets. Do you see a plague of renegade cyclists? An endless stream of automobiles? Or do you, like me, see this and think that a little perspective is in order? Licensing bikes would do nothing more than create another level of bureaucracy in a cash-strapped city, and solve nothing. Right now, if a police officer pulls over a cyclist for running a red light, riding on the sidewalk, or going 31 mph, the officer can ask to see the cyclist’s ID. (Despite the council member’s claim, carrying an ID in a shirt pocket or tucked into your Lycra shorts is very simple. Some of us don’t need two ton metal boxes in which to carry our identification.) If the cyclist is not carrying any, the officer can detain–not arrest, but detain–the cyclist until his name and address can be identified. Making cyclists carry ID or place a decal on their bikes won’t help expedite that process, especially since old bikes are sold and swapped all the time. Another small issue: Since teenagers have as much of a right to ride on city streets as adults, only requiring this of people over 18 years of age accomplishes very little other than adding one additional barrier to getting people on bikes. There’s also the straw man argument of the rogue cyclist who mows down a pedestrian and then rides off, identity unknown. In what way would a license plate or sticker help? The next time you see a cyclist pass you at an intersection, try to read the word printed on the back of his saddle. (Usually it’s a brand or model name.) Impossible, no? I doubt most people would even be able to read the bike brand printed on the top tube or a word printed on the back of a t-shirt. So what levels of attentiveness and eyepower would a dazed pedestrian have to possess in order to reliably get a cyclist’s registration number? Or how big would the license plate have to be to render it visible from a distance? This big? This is nothing more than an attention grab by a young city council member who saw the growing backlash against bikes, along with a local news industry too lazy to report on the real dangers on city streets and too ready to exploit hysterics for ratings, and used them both to boost his political fortunes and get his 15 minutes of fame. Considering that New Jersey backed down from a bike licensing scheme, he might not even make it to 5 minutes.